The Fifth Sasakawa USA Annual Security Forum this month was an opportunity for reflection on the relationship between two allies. In the five years since the first Forum in 2014, the Alliance and cooperation between Japan and the United States have never been stronger. However, the improvements have barely paced the threat. The security environment in East Asia has steadily become more difficult, with the increasingly aggressive policies and actions of both North Korea and China. North Korea’s non-nuclear military capability appears to be relatively steady—formidable both in the early stages of an invasion, and able to mount a grinding and dogged defense against any counterattack. Its nuclear and missile capabilities have increased dramatically, with an unprecedented tempo of missile launches and nuclear tests. Kim Jong Un has shown us four months of sweetness and light, following six years of reckless missile firings, nuclear tests, and defiance of the international community. Meanwhile he has killed dozens of those who might take his place and strengthened the North Korean police state. I have low expectations for substantive agreements coming out of the current round of summitry, and anticipate that a disappointed Kim Jong Un will return to confrontational behavior later this year. China in the last five years has also pursued generally aggressive policies in the region. In the South China Sea, it has expanded its influence on a wide range of fronts, most notably military construction on the islands it occupies in the Spratlys, and has defied the binding ruling of the Permanent Court of Arbitration. In the East China Sea, it has routinely flown its aircraft and sailed its coast guard and navy ships around the Senkaku Islands, with occasional spikes of activity. Its Indian Ocean presence has been slowly increasing, with the establishment of a base in Djibouti giving it better logistic support for a larger presence. Of the two countries, Japan has been the more consistent and steady in its policy, activities, and capability enhancements. How have the United States and Japan responded? Of the two countries, Japan has been the more consistent and steady in its policy, activities, and capability enhancements. 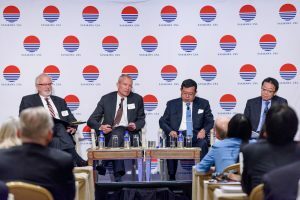 At the Annual Security Forums over the last five years there has been a great deal of discussion of Japan’s dramatic changes to its security policies to allow its Self-Defense Forces to better deal with rising threats. The evolution of its Self-Defense Forces’ ability to cooperate with the United States to face complex contingencies in East Asia has continued to grow in recent months. As an example, the Ground Self-Defense Forces announced the initial operational capability of a regiment specially trained in amphibious warfare to recapture islands. 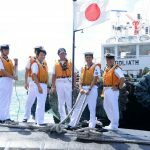 As demonstrated in the tabletop exercise Pacific Trident, the Japan of 2018 has the legal authority and the political will to deal with North Korean provocations that it did not have in 2014. Japan has increased its defense budget for the past five years, after years of decreases, although these expenditures have been only a fraction of China’s military budget increases. The United States over the past five years has been solid in its support of the U.S.-Japan alliance–most notably in declaring at the Presidential level in both administrations that the Senkaku Islands are covered by Article V of the U.S.-Japan Treaty of Mutual Cooperation and Security. However, neither the Obama nor the Trump administration has developed a consistent, integrated diplomatic/economic and military set of policies towards either China or North Korea. The Obama administration announced a policy of rebalancing to Asia in 2014-15, but could never explain it well, to either internal or external audiences. In Southeast Asia, the President and other cabinet officers dutifully attended summit meetings, but the United States did little to oppose aggressive Chinese actions in the South China Sea. The administration did not react to either North Korean provocations or nuclear weapons developments, and it attempted to manage China by high-level nagging and lecturing. The Trump administration, for its part, has been consumed with North Korea’s nuclear development program and has tightened economic sanctions, but has alarmed friend and, apparently, foe, alike with its confusing pronouncements and actions. The administration’s China policy is a bewildering combination of summit bonhomie, tariffs, and heavier military deployments from the Korean Peninsula down to the South China Sea. It has put heavy pressure on its allies to reduce trade deficits, but it remains to be seen if it can, as the Reagan administration was able to, manage trade frictions with security cooperation. 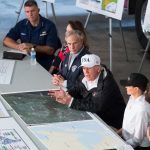 As for its military budget, the United States has lost whatever small increases have been made since 2014 through sequestration and continuing resolutions. Next year’s large increase for the Department of Defense came as part of a debt-exploding deal that is unlikely to be sustained. Despite Japan’s consistent and positive, if inadequate, response to the threats it faces, and America’s inconsistent and often ineffective policies and actions, the strategic balance in the region has not deteriorated dramatically over the past five years. There were two major factors involved. The Pacific Command and the military services never lost sight of the growing threats in East Asia. First, despite inconsistent policies at the national level, the Pacific Command and the military services never lost sight of the growing threats in East Asia. Although overall budgets did not grow, the Navy continued to shift more of its combat forces to the Pacific and forward-deployed its most advanced equipment to the Seventh Fleet. The Air Force also prioritized East Asia in its deployment decisions for the F-22 and F-35, and emphasized China’s capabilities in planning its space and cyber modernization. The Army continued to support a robust exercise program in Korea, increasing its emphasis as troops were withdrawn from the Middle East. This continuing military emphasis and prioritization of forces, especially by the Navy and the Air Force, has maintained American deterrent capability in the region from the South China Sea through Taiwan and the Senkaku Islands, up to the Korean Peninsula. Second, China and North Korea’s aggressive policies have alarmed the other countries in East Asia and caused them to both raise their defense budgets and turn to the United States and Japan for support. Other South China Sea claimant countries have offered the United States use of their bases for peacetime exercises, and, almost certainly, for use in crisis or conflict. From a military point of view, these bases offer projection platforms far superior to the three fortified islands in the Spratlys in any conflict in that region. India, always concerned about Chinese direct threats in the disputed territories along the common border, and now alarmed by the economic and military consequences of the Belt and Road Initiative, has increased its diplomatic and military cooperation with both the United States and Japan. Where does the U.S.-Japan security alliance go from here? What should those at the tenth Annual Security Forum in 2023 be able to discuss? In the military dimension, the United States and Japan must continue to accelerate improvements to their individual military capabilities, and, equally important, their ability to plan, exercise, and operate together. As explained in the American defense strategy at the Security Forum, this emphasis is in line with the policies of the current administration. For the United States, this means continued prioritization within Navy and Air Force programs of the capability to deter China and North Korea. For Japan, this means acceleration of the current plans to form a joint operational headquarters, of deploying the Aegis ashore missile defense, and deploying the F-35. Japan’s defense expenditures must continue to grow to offset the increasing Chinese allocation of resources to the PLA. The U.S.-Japan alliance will continue to play a critical role in ensuring regional security. In addition, the defense forces of both countries must accelerate the pace of their capability to operate together across the spectrum of possible alliance operations—from natural disasters on the order of the 3/11 earthquake, tsunami, and nuclear plant meltdown, through aggression against the Senkaku Islands, through attacks against Taiwan and South Korea. In each of these contingencies the armed forces of the two countries will have different responsibilities. For natural disasters and Senkaku Islands contingencies, Japan will take the lead. For Taiwan and South Korea, it will be the United States. Both countries need to establish joint operational staffs and a combined planning and exercise program for all four contingencies. A planned and exercised combined capability to handle these threats is the best way to deter them. There are two other urgent military requirements. First is the strengthening of the military capabilities on the Ryukyu, or Southwest island chain. The Japan Self-Defense Forces have already taken important steps, establishing airfields and anti-ship missile units there. A well-defended sea and airspace east of the Ryukyu Islands will greatly improve the American capability to bring force to bear in case of contingencies in the Senkaku Islands or Taiwan. The second urgent military requirement is trilateral military cooperation among Japan, the United States, and the Republic of Korea. As was reported in the Annual Security Forum panel on tabletop Exercise Pacific Trident, if the three countries cooperate closely at both the political and the military levels, they can handle North Korean provocations. Cooperation is especially important in missile defense, but it needs to go further. East Asia for the past half century has been a model of economic and political development. The U.S.-Japan alliance will continue to play a critical role in ensuring regional security, allowing countries in this region to continue economic growth through international trade and investment. I recommend a careful reading of the formal communique of the summit meeting, rather than press reporting, or even the transcript of the joint press conference of the two leaders. Communiques for summit meetings are drafted with care in consultations between the staffs of both delegations and approved by the heads of state. They represent the considered results of the meetings, drawing on the overall relationship between the countries and the issues they face together. 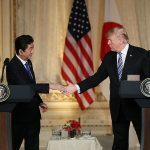 The communique from Mar-a-Lago shows clearly that the U.S. and Japan are united on the big security issues that both countries face. In this Chairman’s Message, written on the eve of President Donald Trump’s first trip to East Asia, Admiral Dennis Blair stresses the importance of maintaining U.S. alliances in Japan and South Korea and of articulating a vision for the Asia-Pacific for the President’s trip. In this Chairman’s Message, Admiral Dennis Blair discusses the postponed “2+2” meeting between the U.S. 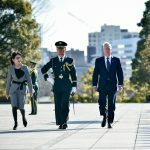 Secretaries of State and Defense and Japan’s Ministers of Foreign Affairs and Defense, and explains that the postponement does not reflect any deterioration of U.S.-Japan relations. An amendment to Japan’s constitution to provide a legal basis for the SDF is long overdue. Yet, before this happens, the Government of Japan must clarify civil-military relations, and the roles and missions of the three SDF services need to be reassessed.